The First Navy Jack Flag was allegedly created by Commodore Esek Hopkins, the first Commander-in-Chief of the United States Navy when he issued orders for the first US navy ships to "fly a striped Jack and Ensign at their proper places." The flag had 13 red and white stripes with an American rattlesnake, a symbol of American unity, in the center, over the words "Don't Tread on Me." In spite of the fact that many Americans believe this is the first flag of the United States Navy, there is no definitive proof that the flag existed during the Revolutionary War. According to legend the First Navy Jack Flag, which is sometimes called the Continental Navy Jack, was raised on the first US Navy ships in the fall of 1775. The Congress had just created the Navy and they appointed Commodore Esek Hopkins, a Rhode Island captain, as the first naval Commander-in-Chief. Hopkins issued a set of fleet signals. The attack signal was to be the raising of "the striped Jack and Ensign at their proper places" from his command ship, the USS Alfred. The exact design of the flag was not specified, but the traditional belief is that the First Navy Jack Flag consisted of 13 red and white stripes with a stretched out rattlesnake across the center. The words Don't Tread on Me stretched across the bottom below the snake. It is likely that John Paul Jones would have raised the First Navy Jack Flag on Commodore Hopkins' flagship since he was the ship's first 1st Lieutenant. The rattlesnake was a common symbol representing unity against oppression to the colonists. The symbol was first used by Benjamin Franklin in an article he published in 1751. In it, he condemned Great Britain for sending convicts to America and suggested the colonists should respond by sending a bunch of rattlesnakes back to Britain to be put in the gardens of the nobility. A few years later, in 1754, Franklin published the first political cartoon in the colonies in order to encourage support for the Albany Plan, which was a plan of unity he had submitted to the Albany Congress, a meeting of the colonies to discuss their joint defense in the French and Indian War. 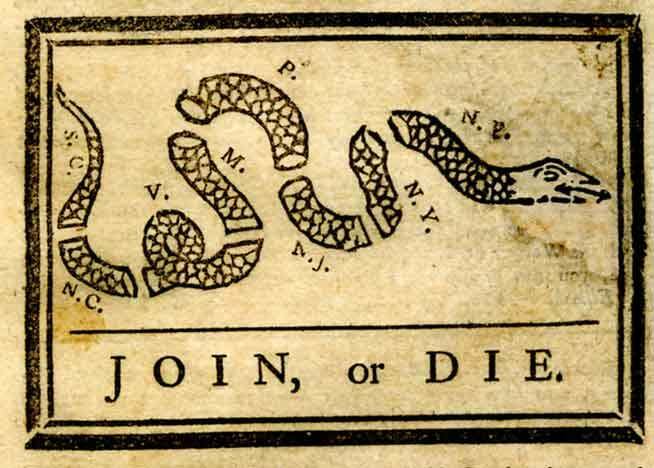 The cartoon featured a snake cut in 8 pieces representing the colonies, over the words "Join or Die." The meaning was that the colonies must work together to defend themselves against the threat from the French and their Indian allies because they would be defeated if they tried to work individually. This was the first call for American unity, 20 years before the Revolutionary War. The emblem came to prominence again during the Stamp Act crisis ten years later when all 13 colonies were facing a threat of higher prices for many common goods such as paper, marriage certificates, licenses and anything else printed on paper. Parliament had passed the Stamp Act to get better control of the colonies' economy and to pay off the staggering debt incurred during the French and Indian War. The rattlesnake symbol was again used to represent American unity against the threat of government oppression. The term "jack" in the title of the First Navy Jack Flag is referring to any flag flown from the bow of a ship. The jack is not the entire national flag, but only the part that appears in a flag's canton, which is the upper left corner. So the jack of the United States flag is simply the blue field with 50 stars. This is called the Union Jack and it is flown from all ships of the United States Navy today. Similarly, the British Union Jack is the familiar red, white and blue cross and X that we are familiar with today. Jacks are flown from the bow of the ship for easy identification when a ship is at port because the ship's main flag on the top mast may be too far away or blocked by rigging for people on the ground to see. First Navy Jack Flag - Truth or Legend? Nearly every dealer of historical American Revolution Flags carries the First Navy Jack Flag, but was this flag really flown by the first US Navy ships? Most historians agree it was not. So where did the First Navy Jack Flag come from? There is evidence that the snake and the words "Don't Tread on Me" appeared together on other Revolutionary War era flags. The rattlesnake with the motto appeared on flags carried by Proctor's Independent Battalion of Westmoreland County, Pennsylvania and Sullivan's Life Guard during the Rhode Island campaign of 1777. The snake and motto also appeared on drums, currency and other military supplies. The snake and motto even have other specific ties to the US Navy. 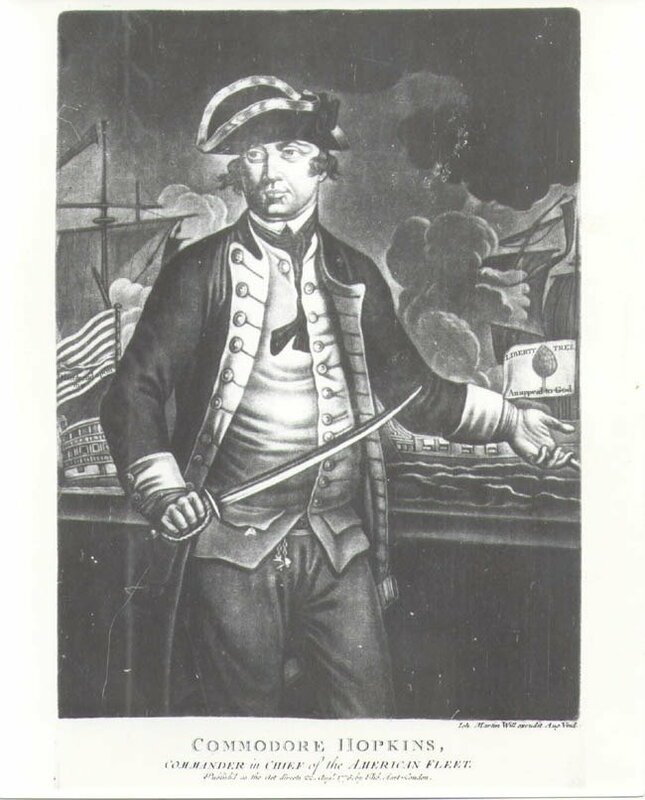 In February 1777 a group of officers proposed that the official uniform of Continental Navy captains should include a gold epaulet on the right shoulder with "the figure of a Rattle Snake Embroider'd on the Strap... with the Motto "Don't tread on me." So the question is not whether the snake and motto appeared on any Revolutionary War flags or was associated with the Navy, but whether or not they appeared together with the stripes on the first naval flag. In Commodore Hopkins' original order to his new fleet, he says the flags will be "the striped Jack and Ensign at their proper places." Notice that the order says the striped flag is to be raised, but it says nothing about the snake or the words "Don't Tread on Me." From the outbreak of the Revolutionary War until mid-1777, a year after the Declaration of Independence , the flag used by most US troops and ships was the Grand Union Flag. 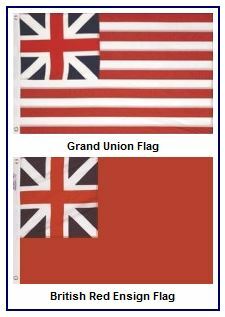 The Grand Union was a modified British Red Ensign Flag, which was the official flag of Great Britain. Keep in mind that until the Declaration of Independence the colonies were part of Great Britain so the British Red Ensign Flag was their flag as well. The British Red Ensign Flag was a red flag with the British Union in the canton. 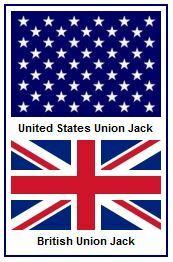 The Union was a cross between the flags of Scotland and England before the two were united into one nation in 1707. The British Union was was a royal emblem and could only be flown legally by military ships. It was illegal for anyone else to use it. At the outbreak of the war, colonists modified the British Red Ensign Flag by adding white stripes to the red field. This would have been an easy modification that anyone could make simply by sewing white strips of cloth onto a British Red Ensign. The new flag became known as the Grand Union. Colonists used the Grand Union at first because they still considered themselves to be British subjects, but they modified it to signify that they were not going to be abused by the British government. It was illegal for them to use the British Union, so by using it and modifying it they were making a clearly defiant statement of protest. The colonists continued to use the Grand Union as their official flag for the first two years of war. Finally on June 14, 1777, Congress passed the Flag Resolution of 1777 which designated that the US Flag would have 13 stars on a blue field to replace the British Union. Now they would have their own flag, showing that they were indeed separate from Great Britain. Colonial American flags had a history of using red and white stripes. The Sons of Liberty Flag had been flown since the time of the Stamp Act and it consisted of 9 or 13 red and white horizontal stripes. Another flag called the Colonial Merchant Ensign was the same. It was commonly flown by New England merchant ships. So when Commodore Hopkins chose the red and white stripes he was keeping with the common tradition. Most historians believe the actual flag flown from the Alfred and the other ships of the nation's first fleet was this simple red and white striped flag minus the snake and words, or possibly the Grand Union Flag. First Navy Jack - the snake? So how did the snake and the words get onto the design? Several historians believe they have discovered how the First Navy Jack Flag came to have the snake and motto and worked its way into popular American folklore. During the time of the American Revolution, a London merchant named Thomas Hart had a print made of Commodore Esek Hopkins. Hart had never seen Hopkins, so his print was based on secondhand accounts of what he looked like. The print includes two ships in the background flying flags, one flying the First Navy Jack Flag with the snake and motto and the other flying a white flag with a pine tree and two mottos - "An Appeal to God" and "Liberty Tree." This is a version of a flag known as the Washington Cruisers Flag, a flag flown on a squadron of ships George Washington personally outfitted for the protection of Massachusetts. The Washington Cruisers Flag is really the first naval flag flown by the Americans, even though Congress had not yet created the United States Navy. The Thomas Hart engraving is actually the first time the snake and the "Don't Tread on Me" motto appear on the national US Flag - on a European artist's rendition of Commodore Hopkins! Hart's painting is not historically accurate in a variety of ways. First, Hopkins appears to be a young man in the print, but in actuality Hopkins was 58 years old at the time. Second, the flags are flying from the ships' sterns, when jacks are supposed to be flown from the bow. Third, no one has ever suggested that the pine tree flag was ever a Naval Jack, but it clearly appears in the print as well. It seems that Hart was simply drawing American flags he had heard of. Where did Thomas Hart get the idea to put the snake on the flag? 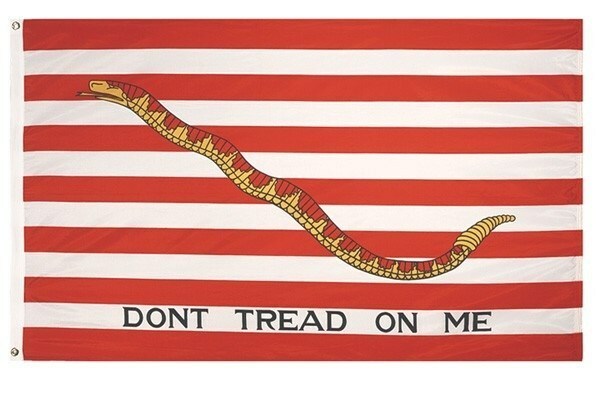 Historians believe Hart was confusing the First Navy Jack Flag with the Gadsden Flag, Commodore Hopkins' personal standard, which did have the snake and the motto "Don't Tread on Me." Congressman Christopher Gadsden of South Carolina served on Congress' Marine Committee which oversaw the navy. He personally designed a flag for the Commander-in-Chief of the Navy in keeping with European military tradition that the head of the navy should have his own flag. The Commodore's flag was to always be flown on whichever ship he was personally present. 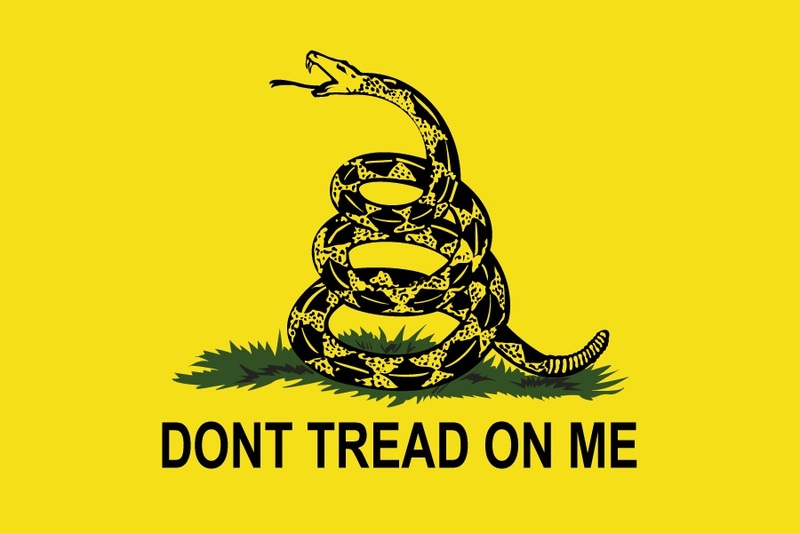 The flag Gadsden designed was a yellow flag with a coiled rattlesnake over the words "Don't Tread on Me." The snake's tail had 13 layers representing the 13 colonies. This came to be known as the Gadsden Flag. Scholars believe Thomas Hart had been told about both flags and mistakenly combined the details of each. He clearly hadn't seen them first hand. He mixed the elements of both flags into one and Voila!, the First Navy Jack Flag was born! Some historians believe Hart's inclusion of the snake on the flag may have been a deliberate attempt to mock the Americans. On all other American flags that have a rattlesnake, the snake is positioned in a coil and ready to strike. Hart drew the snake in a stretched out slithery pattern as if the snake is trying to escape. By adding the phrase "Don't Tread On Me," some have suggested Hart was trying to make it as if the snake was pleading, "(Please) Don't Tread On Me!" It will never be known for sure! Several later versions of Hart's print have the red and white striped flag with no snake or motto. Others have the snake and motto with no stripes! Clearly whoever was making the prints had heard some details of the flags, but had never actually seen them. This is the only reference anywhere to be found of the First Navy Jack Flag until 1880 when American Admiral George Henry Preble published a book called History of the Flag of the United States. In the book, Henry used the design from the Hart prints and called it the First Naval Jack of the United States. The book states that "the striped jack may have been a flag of thirteen stripes, with a rattlesnake undulating upon it." The flag is clearly not historically accurate, but since History of the Flag of the United States was considered to be the most authoritative work on the American Flag, subsequent generations believed it. Authors repeated his claims and reprinted his drawings. School children were taught the First Navy Jack Flag was truly flown on the first United States ships. By the turn of the century, most people believed the myth. The First Navy Jack Flag was eventually recognized by the US Navy and flown from ships on special occasions and it is so still today! In Preble's book, he shows the First Navy Jack Flag clearly with red and white stripes along with the snake and the motto "Don't Tread on Me." He also shows the same flag, but with red and blue stripes. There is no description of the flag or where it came from. Later, in 1917, an article appeared in National Geographic magazine by Byron McCandless and Gilbert Grosvenor called "Flags of the World." In the article, McCandless and Grosvenor reprinted the First Navy Jack Flag with the red and blue stripes and associated it with the South Carolina Revolutionary War era navy. Again, because of the assumed authority of the magazine and the authors, the article was assumed to be true and became accepted by generations of Americans. There is, however, no proof South Carolina ships ever flew such a flag. The Preble book seems to be the source for all later references to the South Carolina flag who just reproduced Preble's artwork. McCandless and Grosvenor may have drawn a connection between this flag and South Carolina because of a letter from Benjamin Franklin and John Adams written in 1778 indicating South Carolina had a flag with the snake and motto. In 1778, both men were representing the fledgling United States in Paris. The Kingdom of Sicily had just granted US ships the right to land in her ports. Franklin and Adams wrote a letter of thanks to Domenico Caracciolo, the Ambassador from Naples to France, in which they described the 13 Star Flag of the United States so the Sicilians would know what it looked like if a US ship were to arrive. They described the flag according to the Flag Resolution of 1777, but made a mistake by saying the stripes were red, white and blue. In the letter, Adams and Franklin also mention that some of the states also have their own navies, which may be flying their own flags. They say the Massachusetts Navy would be flying a white flag with a pine tree and the South Carolina Navy would be flying a flag with "a Rattlesnake in the Middle of the thirteen stripes." The letter does not say what color the stripes were! This is the only other mention of such a flag. No other references identify such a flag with South Carolina. It's possible they were repeating from a secondhand account told to them or they were just passing along misinformation. It's also possible South Carolina truly had the flag. There simply isn't enough evidence to say for certain. Historians seem to agree though that there was no such flag. You can read the complete letter from Benjamin Franklin and John Adams to Domenico Caracciolo here. 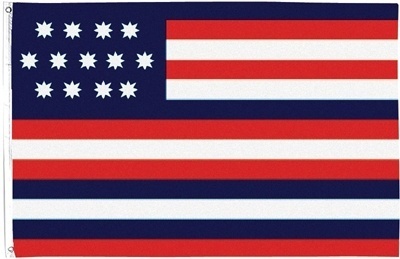 As a side note, it's possible that neither Franklin nor Adams had ever seen a United States flag before. Franklin had been in Paris since before the Flag Resolution was passed and Adams left the United States from Boston several months after the Flag Resolution. 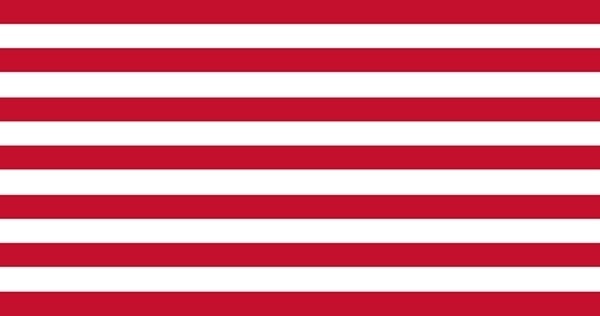 The US flag they describe is similar to one created for John Paul Jones' ship Serapis from another description Franklin gave the following year which has come to be known as the Serapis Flag. Franklin clearly thought the US Flag had red, white and blue stripes! The First Navy Jack Flag is used sometimes today to mark special occasions at the direction of the Secretary of the Navy. It was probably never actually used in the history of the navy until the nation's bicentennial celebrations in 1976! It is believed that staff people in the United States Navy found the flag in history books and assumed it was historically accurate. They had the flags mass produced for flying on US Navy vessels. The flag was flown from all US naval vessels for the entire years of 1975 and 1976, even though it was an historically inaccurate flag! Beginning in 1977, the Secretary of the Navy announced a policy stating that the First Navy Jack Flag should be flown at all times from the naval vessel with the longest period of active service. As of May 2009, the honor was bestowed on the USS Enterprise, when the USS Kitty Hawk, which had the honor previously, was decommissioned. On May 31, 2002, the US Navy announced that all United States military vessels would fly the First Navy Jack Flag from their bows until the war on terrorism has finally come to and end. There is a movement to see the navy end its use of the First Navy Jack Flag because of its dubious history and see the Washington Cruisers Flag restored to its place as the first flag of the US Navy. The First Navy Jack Flag myth is well entrenched, however, in the minds of Americans and retiring it will be quite the feat! Order your very own First Navy Jack Flag here and help support this website with your purchase. Learn more about other historical American Revolution Flags here.